In early August of this year, the North Carolina Study Center was coming alive in anticipation for the fall. In the midst of time spent gearing up for a full docket of of activities and plans, we had a new idea: a conference that would bring together UNC students, faculty and alumni for the purpose of exploring how the Christian faith relates to vocation and speaks to every facet of life. For more materials from the conference, including recordings, bios and the conference program guide, click here. Following numerous conversations, brainstorming sessions, and a great deal of prayer, the inaugural Wilberforce Conference at UNC was a go. The central theme,"Meaningful Work and Lives Worth Living," was crafted to reflect and honor the conference’s namesake, William Wilberforce, the 18th-19th century British statesman, ardent Christian, and tireless crusader against the slave trade. Wilberforce refused to lead a bifurcated life in which his faith was compartmentalized from his work, his social life, and his civic engagements. The idea was to recruit a group of speakers and panelists who would be able to publicly champion examples of faithful lives, while also using the conference as an occasion to gather students, campus ministries and alumni alongside university leaders. 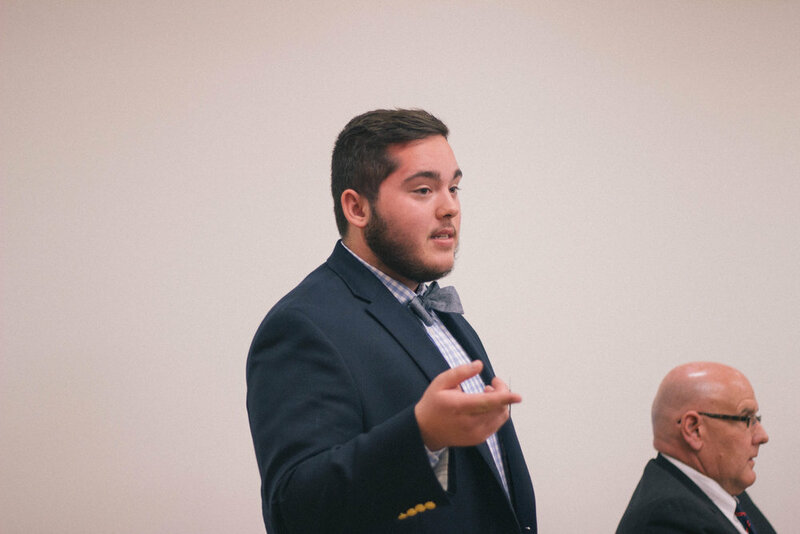 Sam Weeks ('17, double-majoring in Biology & English) was one of twelve UNC student leaders who helped plan, organize and host the conference. One of the great joys in organizing the conference was working with nearly a dozen undergraduate students who volunteered to be a part of the Wilberforce Student Advisory Committee. These students helped to plan and execute virtually every major aspect of the conference: deciding upon the panel themes, working with moderators and panelists to develop questions and topics, issuing invitations to alumni, and publicizing it among classmates and peers. Wilberforce 2016 would not have been possible without the involvement of these students, nor without the role played by alumni supporters, Study Center Board members and dozens of other volunteers who selflessly dedicated their time and resources. Katherine Heffner ('19), another student leader, meeting and greeting before the conference. Two and a half months after the idea was initially proposed the conference became a reality. As the day began, registrations continued to increase and last minute arrangements were put in place. At 12:30pm on Friday, November 4th, Wilberforce 2016 was officially underway as students and alumni began trickling into the Frank Porter Graham Student Union to check-in. As attendees collected their name tags and perused the handouts in their conference folders, some proceeded to stake out the best seats in the auditorium while others met and mingled in the lobby. Ten minutes after 1:00pm, organizers urged the growing crowd into the auditorium and soon thereafter, the conference commenced with an opening speech from UNC Chancellor, Dr. Carol Folt. In her remarks, Chancellor Folt praised the conference’s theme, "Meaningful Work and Lives Worth Living,” deeming it worthy of serious attention and as contributing to the type of student formation that should be taking place within the University. She expressed enthusiasm about the number of attendees and praised conference participants for their desire to think about work and vocation in terms broader than simply bottom-line profit-seeking. Perhaps most significantly, her presence and words that afternoon symbolically affirmed the relevance of the Wilberforce Conference to the mission and work of UNC as an institution. Although faith can often feel marginal to the life of the University, Chancellor Folt’s message that afternoon celebrated the effort to incorporate faith into vocational discernment. Chancellor Folt addressing participants at the start of the day. Following these introductory remarks, Dr. Steve Garber delivered the keynote address. A writer and teacher, Dr. Garber is the principal of The Washington Institute for Faith, Vocation & Culture, which aims to reframe how people understand their lives of work and faith. Dr. Garber’s address provided participants with a deeper understanding of the conference’s theme, as well as a greater vision for what meaningful work and lives worth living might actually look like. His talk wove together tales from the lives of William Wilberforce and Walker Percy, a famed author and UNC alum. Both wrestled with God’s call on their lives, a call they followed at great cost but also to great effect. Dr. Garber emphasized how both Wilberforce and Percy allowed their faith to inform their understandings of what they were meant to do and of how they were meant to live. Drs. John Thorp, Joan Perry, Mark Miller, and Farr Curlin on panel titled "Medicine as Christian Vocation?". Still ruminating on Dr. Garber’s speech, attendees transitioned at 2:10 p.m. from the auditorium to the next session, a series of panels focused on meaningful work. Participants could choose between three distinct vocational arenas: entrepreneurship, medicine and media journalism. These panels had been organized to bring together diverse representatives from these respective fields: men and women, for-profit and non-profit business leaders, professors and practitioners. Each panel was led by a moderator who had worked with members of the Student Advisory Committee to carefully plan out the questions they wanted to ask: Charles Merritt (Executive Director of the UNC Minor in Entrepreneurship) for the "Life, Risk and Calling" panel, Dr. Farr Curlin (Professor of Medicine and Medical Humanities at Duke University) for the "Medicine as Christian Vocation?" panel, and Jessa O’Connor (UNC, B.A. Media and Journalism, Class of 2017) for the "Truth and Creativity Without Apology" panel. In reflecting on this session, one student spotlighted Bill Keyes' (UNC Board of Trustees and Founder of The Institute for Responsible Citizenship) remark during the "Life, Risk and Calling" panel that it is less parlous to do something "risky" that you know God is calling you to, than to do something "conventional" that you know God is not calling you to. David Walden ('14, MAC '15) interviewing Tom Darden ('76) about ambition, calling and investment. After these panels wrapped up, everyone made their way back to the auditorium from their break-out location within the Union for Session 3: ‘Gotta Serve Somebody: Ambition, Calling & Investing Your Talents.’ This portion of the day involved recent UNC alum David Walden (’14, MAC ’15) interviewing Tom Darden, CEO of Cherokee Investment Partners, about managing ambition in a God-honoring way and stewarding the gifts God has given you for the sake of His glory and the common good. Darden has strived to do both, using his success and platform with Cherokee Investment Partners to launch Cherokee Gives Back, a foundation that develops leadership, promotes environmental stewardship and reduces poverty around the globe. Several students commented that they appreciated the pairing of a young Carolina alum and a more seasoned Carolina alum. As one student later described to us: “It’s really sinking in that my classmates and I are not the first Christians to come through Carolina. We are part of an intergenerational Christian movement at UNC." Attendees then transitioned to the second round of panel discussions, this time to explore the theme of 'Faithful Lives.' The aim of this session was to foster honest conversation about the joys and difficulties of living faithfully to the Gospel amid the complexities of 21st century American life. The three panels were, "Can Women Have it All? ", "Seek the City: Does Anything Make a Difference? ", and "Navigating Corporate Culture." Several students told us afterwards how much they appreciated the frankness of the discussion in these panels. The "Can Women Have It All?" panelists did not sugarcoat their stories of sacrifice, nor the painful decisions they have faced during their careers as they sought to honor God in finding the right work-family balance. David Morken, CEO of Durham Cares, was honest about the great challenges that unavoidably come as part and parcel of caring for ‘the least of these.' One student used the word “raw” to describe the panel she attended, in the sense that the panelists were bluntly honest about the ways that faith challenges us not to shrink from the brokenness of the world, but rather to engage it with the love of Christ and the confidence that the Gospel instills. Shanon Thompson ('18) and others at the NC Study Center. The first ever Wilberforce Conference at UNC wrapped up with a NC-style BBQ dinner under a magnificent white tent on the front lawn of the Study Center. As the sun set, strands of lights illuminated the tent, candles were lit, the meal was blessed, and 200+ guests took their seats to enjoy pulled pork, macaroni and cheese, coleslaw, baked beans, and cornbread. One of the more memorable parts of the day was witnessing the lively dinner conversation where old friendships were rekindled and new friendships were formed. As attendees finished their dinner and feasted on homestyle banana pudding for dessert, Dr. Garber once again took the stage to bring the conference to a close. After telling a few more stories and tying together many of the day's themes, Dr. Garber wrapped up his address by posing a thought-provoking question: “Can you sing songs shaped by the truest truths of the universe, but in language the whole world understands?” In other words, can you live in the world and pursue your vocation in a manner that is at once both deeply shaped by the truths of the Gospel, while also being translatable, and even appealing, to non-Christian peers? The hope and aim of the Wilberforce Conference was to answer Dr. Garber’s concluding question with a resounding “Yes!” and to spur the imagination of students and alumni to consider how their own “song” might sound.